Mazda made quite the splash at the recent Los Angeles Auto Show when it unveiled the all-new 2017 Mazda CX-5, the newest generation of what has now become Mazda’s most popular and best-selling vehicle. The new CX-5 has been improved in every way, although it retains the features and characteristics that made the current model so popular. The big news with the all-new 2017 Mazda CX-5 is the introduction of a brand new diesel engine which should arrive sometime next year, a little bit after the launch of the CX-5 at King Mazda in Saint John, New Brunswick. This SKYACTIV-D 2.2-liter four-cylinder diesel engine has been offered in Europe for quite some time now, and it has proven its reliability, its efficiency and its fuel economy. It offers plenty of low-end torque which makes passing and accelerating in the city a breeze, and is also quiet and refined. We don’t know what kind of power will be supplied by this new diesel engine, however, but that information should be released soon enough. The SKYACTIV-D 2.2-liter engine will join two gasoline-powered engines currently offered on the CX-5. The first powers the entry-level models (GX and GS) and offers 155 horsepower and 150 lb-ft of torque. The second engine is a 2.5-liter, four-cylinder SKYACTIV-G engine that delivers 184 horsepower and is found in the top-of-the-line GT model. As with the current CX-5, the new 2017 Mazda CX-5 will come standard with front-wheel drive while all-wheel drive will be optional. That said, the new CX-5 will get Mazda’s all-new G-Vectoring Control system which is part of SKYACTIV-VEHICLE DYNAMICS. G-Vectoring Control is actually the first technology to be introduced from the upcoming SVD suite of technologies. It is designed to improve comfort and stability at low speeds in the city as well as at higher speeds on the highway by using the engines torque to stabilize the vehicle and reduce side-to-side movements and steering wheel movements. The end result is that you feel a lot more comfortable inside the 2017 Mazda CX-5. Along with its new diesel engine and G-Vectoring Control, the 2017 Mazda CX-5 happens to be a lot more refined both inside and out. A new exterior look featuring a larger grill that mimics the one found on the larger Mazda CX-9, a new Soul Red Cristal color that is easily among the most impressive in the industry, and a host of other subtle exterior changes make it easy to recognize the new 2017 Mazda CX-5. 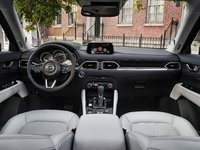 Inside, the compact SUV gets more upscale materials, a redesigned center console and dashboard, a little bit more interior space. To learn more about the 2017 Mazda CX-5, contact us today at King Mazda!